Manchester City Council has granted planning permission for the conversion of the historic Talbot Mill into 202 new apartments. Situated in the Castlefield conservation area, the historic mill was built in 1855 during Manchester’s textile boom, which rapidly transformed the surrounding Cornbrook neighboorhood from undeveloped land to industrial hub during the late 19th century. Following a £50m restoration by Manchester based developer Capital & Centric the mill will be returned to its former glory with many original features retained. The existing fabric will be celebrated with brickwork walls and arches left exposed. 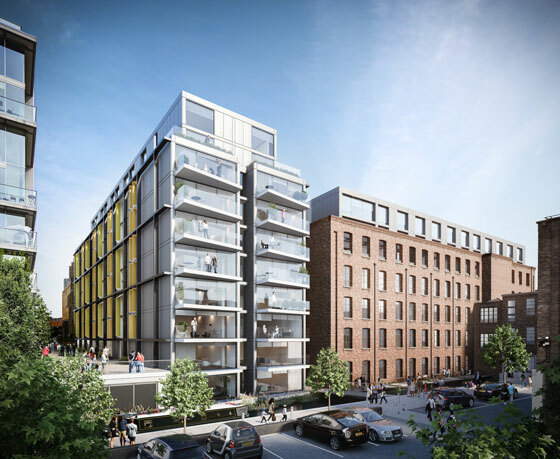 A new new build block at rear of the site will have an expressed steel frame with coloured steel plate oriels for privacy and directing views on the north elevation of the building, and creating balconies overlooking the courtyard on the south elevation. Large balconies will also overhang the canal providing a sun trap for residents.